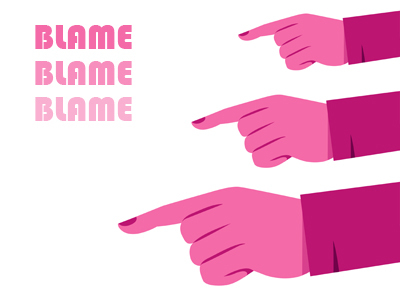 USC/STANFORD (US)—Merely observing someone publicly blame an individual in an organization for a problem—even when the target is innocent—greatly increases the odds that the practice of blaming others will spread, new research shows. The reason: Blame triggers the perception that one’s self-image is under assault and must be protected. Nathanael Fast, an assistant professor of management and organization at the USC Marshall School of Business and Larissa Tiedens, a professor of organizational behavior at Stanford University, conducted four experiments to investigate the viral nature of public blaming. The study is believed to be the first to examine whether shifting blame to others is socially contagious. The results will be published in the November issue of Journal of Experimental Social Psychology. “When we see others protecting their egos, we become defensive too,” says Fast, the study’s lead author. “We then try to protect our own self-image by blaming others for our mistakes, which may feel good in the moment.” In the long run, he adds, such behavior could hurt one’s reputation and be destructive to an organization and to society as a whole. Fast says that when public blaming becomes common practice—especially by leaders—its effects on an organization can be insidious and withering: Individuals who are fearful of being blamed for something become less willing to take risks, are less innovative or creative, and are less likely to learn from their mistakes. A manager can keep a lid on the behavior by rewarding employees who learn from their mistakes and by making a point to acknowledge publicly his or her own mistakes, Fast says. Managers may also want to assign blame, when necessary, in private and offer praise in public to create a positive attitude in the workplace. Managers also could follow the lead of companies such as Intuit, which implemented a “When Learning Hurts” session where they celebrated and learned from mistakes, rather than pointing fingers and assigning blame. The researchers provides empirical evidence that such a practice can avoid negative effects in the culture of the organization. Anyone can become a blamer, Fast says, but there are some common traits. Typically, they are more ego defensive, have a higher likelihood of being narcissistic, and tend to feel chronically insecure. President Richard Nixon is one example the authors point to in the study. Nixon harbored an intense need to enhance and protect his self-image and, as a result, made a practice of blaming others for his shortcomings. His former aides reported that that this ego-defensiveness pervaded his administration. The experiments showed that individuals who watched someone blame another for mistakes went on to do the same with others. In one experiment, half of the participants were asked to read a newspaper article about a failure by Governor Schwarzenegger who blamed special interest groups for the controversial special election that failed in 2005, costing the state $250 million. A second group read an article in which the governor took full responsibility for the failure. Those who read about the governor blaming special interest groups were more likely to blame others for their own, unrelated shortcomings, compared with those who read about Schwarzenegger shouldering the responsibility. Another experiment found that self-affirmation inoculated participants from blame. The tendency for blame to spread was completely eliminated in a group of participants who had the opportunity to affirm their self-worth. “By giving participants the chance to bolster their self-worth we removed their need to self protect though subsequent blaming,” says Fast. The results have particularly important implications for CEOs. Executives and leaders would be wise to learn from such examples, Fast suggests, and instead display behaviors that help to foster a culture of psychological safety, learning, and innovation.